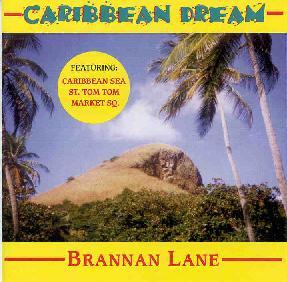 Brannan Lane - "Caribbean Dream"
A bit different for Aural Innovations, but still containing some interesting electronic work, is solo artist Brannan Lane. The stated intention here is to bring new age and world music together on a Caribbean theme. The all-instrumental music features Lane on Latin percussion, pan flute, steel drums, saxophone, classical flute, keyboards, bass, drums, and nature. The promo material attempts (successfully) to categorize each of the 16 tracks so we know before each tune whether it will be of a Caribbean, world/ambient, ambient/space, new age, or reggae nature. In a nutshell, Caribbean Dream couldn't be a better title as I was unable to rid myself of warm island images and found myself craving a pina colada. Nothing adventurous but it did get my toes tapping, and I think electronic musicians would be interested in some of Lane's sounds. Not surprisingly, the tunes that would interest AI readers are the world, space, and ambient entries. The only song I flat out didn't like was the opening track "Welcome" which reminded me more of the t-shirt touristy Caribbean rather than the laid back beautiful blue watered Caribbean that the subsequent tracks managed to illustrate. Lane is already at work on his next release entitled "Blueprint" which will explore a new age & jazz theme. You can email Brannan Lane at brannanlane@hotmail.com.